recently I just took this watch back from the mrs since she too hardly use the watch maybe a few hours a year.. as for me I have not been wearing it for almost a decade! I found this 36mm case too small back then p.s. I was 110kg! ..
.. fast forward to today, I lost almost one inch of wrist size with my weight maintaining at 80-84kg for the pass 5 years. Suddenly all my ‘old’ watches looks as good as ever if not better! My first RO is also 36mm. It is a keeper. Great looking piece, James. Suits you very well. 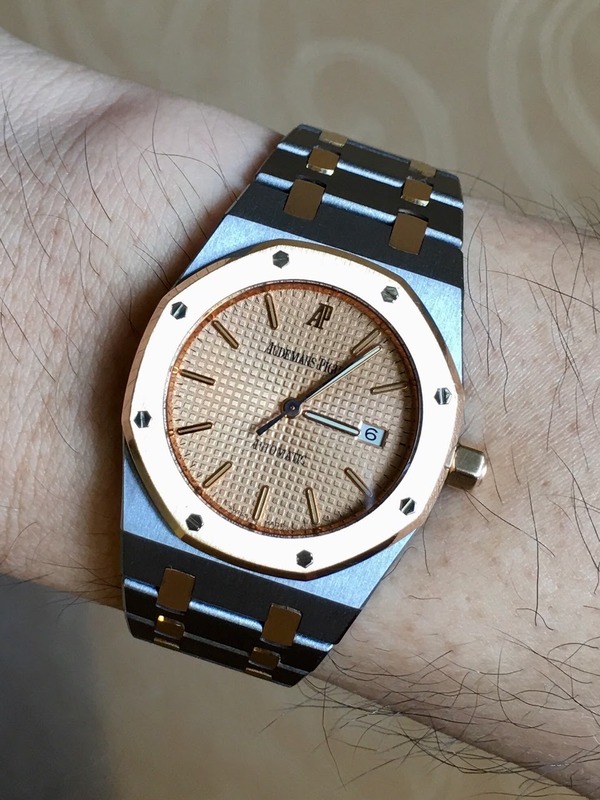 Great looking AP James ..
Beautiful watch, James. And congratulations for getting your health in better order! Lots of exercise junkies on this site (well, at least a few!). Lovely watch, looks very pristine. Which year did you buy it? Cheers, in good health to you and to the watch! Looks good, even a decade later! 36 mm is Nice size makes the bracelet show on the wrist which shows the beauty of RO . You should keep it for your self .